Located on The Esplanade. View the harbour from your dining table , the queen bed in the main bedroom or from the two single beds in the second bedroom of your first floor apartment. It is normal to sleep 4 adults but there is now a queen sofa bed that can be used in the lounge and there is a smalll fold up bed suitable for a child and a fold out cot for baby. There is also a garage. Fast online booking now available through Stayz. Step out and you are walking on the beach or along the promenade just a few metres from your front door as you are staying on the front street overlooking the beach. Enjoy the beach or dine at one of the many cafes and restaurants. Catch a nearby bus to Taronga Zoo, the city centre or other tourist destinations. Come home to all the comfort of a fully equipped kitchen , Nespresso coffee machine, TV with Foxtel Pay TV , or just relax in front of a working fireplace if it's winter. There are 3 sealed heaters as well. There are child proof locks on all windows if you need them. You just lock them in. Available for long term rental at a reduced rate as well as short term. Minimum booking is for 7 nights depending on the time of year. If you see a vacancy of less nights please ask for a cost estimate as I will always try to accommodate you. Bank fees for international transfers or Paypal fees are paid by the guest. If a tradesman is called and upon arrival no fault is found the charge is to be paid by the guest. If a security key is lost the tenant will need to pay for the apartment to be re-keyed by a locksmith. A perfect destination for a romantic honeymoon or holiday. The main bedroom has a queen size pillow top sealy posturepaedic ensemble with silky sheridan bedding. Second bedroom has 2 single beds and there is a queen sofa bed in the lounge as well as a small fold up bed. There is a garage on title. If it's winter, you can light a fire and enjoy the atmosphere in this renovated art deco apartment. Eat out at local cafes or restaurants on your doorstep or eat in using the fully equiped kitchen. Fully serviced cleaning can be arranged if requested so you can relax on your holiday. A remote controlled secure garage is included on title if you have a car. Fully furnished executive apartment will suit the executive who would like to be close to the city but nearer to the beach for the views, great walking, swimming, and boating activities to keep you fit. Perfect if you are home renovating nearby. Weekly service cleaning can be arranged if desired. Sleeps 4 ormally with provision of an extra queen sofa bed and fold up single bed. Cafes and restaurants will home deliver or you can cook in the fully equipped kitchen. Remote controlled garage is included. Includes gas and electricity, Foxtel pay TV and wireless internet. Working at the table and glancing at the water views is very pleasant. Going for a walk on the promenade for a break even better. We love Balmoral. Having lived on the Esplanade for a few years it was so nice to be back. This apartment was perfect for our family. Very clean. And Julie was very helpful. We will definitely be back!! One of the best vacation rentals to-date! This Balmoral unit is fantastic!! Excellent views, strong wifi, garaged parking and a very comfortable bed. Everything in the unit "just works"...the appliances, washer/dryer & dishwasher were superb. Any questions to the host were answered in minutes. The shower has is fantastic...super high-pressure water. 10 out 10! This place is great. Lovely beachfront apartment in a great location! We stayed for 5 days in the winter at this lovely beachfront apartment then a week later for 8 days as we enjoyed it so much. 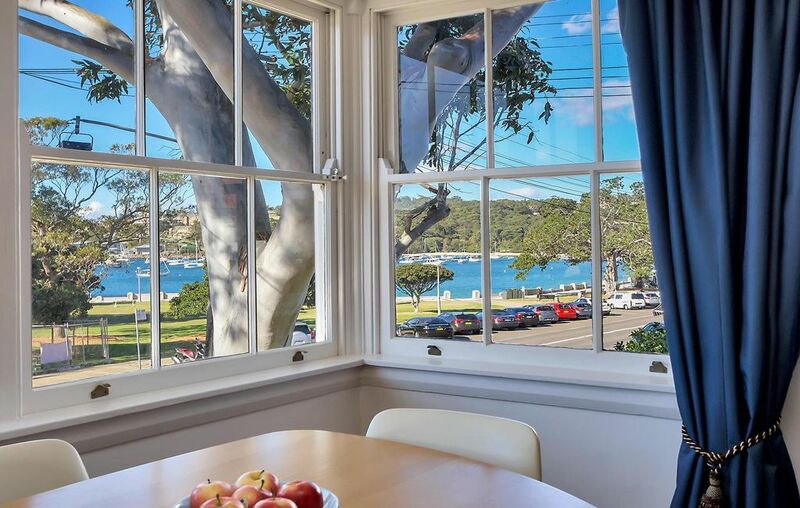 The apartment is on the first floor with big windows, looking out over Balmoral beach and the reserve, in the living room and main bedroom. The building has 4 units and is on the corner opposite a great cafe/restaurant La Republica. It's also across the road from Bathers pavilion and the island. it's a great location just across the road from the beach and also not far from the bus stop to head into the city or go the zoo. The apartment is light airy and spacious with 2 bedrooms and very comfy queen bed in main bedroom. It was very cosy despite being winter time. Julie the owner was most helpful and even offered us a free nights accommodation with our one week booking. We loved our stay here and will definitely be back to stay again. These delightful guests will be most welcome to stay again anytime. They were very friendly & left the apartment in excellent condition. We spent the week of Christmas at the apartment with our 4 year old daughter and could not have asked for a better time. The apartment is comfortable and the hosts were very friendly and available whenever we needed them, but most important is the location, right over the road from the beach! We went for several swims every day, built sandcastles, enjoyed the local cafes and relaxed in the apartment, just divine! Delightful family stayed for Christmas at the beach. Very friendly. Great communication. I hope they stay again on their next holiday. Lovely apartment and fantastic location and view. The hot water pressure was minimal though which didn't make for easy showering. We had a lovely time during our stay with our three kids. The location and view were superb. The apartment was neat and tidy and had everything you would need with nice extra touches. The open fireplace and the garage were also great features. Across the road is pristine Balmoral Beach. Walk to many different cafes & restaurants on the beachfront street. Bus to Taronga Zoo, Mosman Ferry, CBD. Free local bus to main Mosman shops.